The line-up for World Rugby U20 Trophy 2018 is almost complete after Portugal and Uruguay booked their places at the tournament this weekend. Last year’s surprise World Rugby U20 Trophy finalists Portugal will get the opportunity to go one better when the competition is staged later this year after confirming their place in the eight-team line-up as European champions. In a re-run of last year's Rugby Europe U20 Championship final, the Lobinhos defeated neighbours Spain 25-3 on home soil, following earlier wins over a Portuguese select side and the Netherlands. Spain eased past Ukraine and Russia, scoring 111 points without conceding any in reply. Spain took an early lead in the final thanks to a penalty from fly-half Lander Mujika, but Portugal hit back with 13 minutes gone to score the only try of the first half. From a lineout on the Spain 22, Portugal attacked up the middle with second-row Jose Roque and centre Joao Lima making good ground before number eight Duarte Costa Campos received the final pass and crashed over. Lima stroked over a penalty on the half-hour mark for an 8-3 half-time advantage. The third quarter was equally tight, but Portugal eventually found a way through in the 56th minute, scrum-half Martim Cardosa jumping over a pile of bodies at the bottom of a ruck a metre from the Spanish line to score under the posts, American Football-style. The try was converted by Lima, who added his second penalty to extend Portugal’s lead to 18-3. Openside Joao Fezas thought he’d scored Portugal’s third try with 10 minutes to go, but referee Neil Chivers ruled it out because of a double movement. However, Portugal did strike once more, with a minute of added time played, when replacement scrum-half Duarte Azevedo darted over from close range, Simao Van Zeller converting for a final scoreline of 25-3. 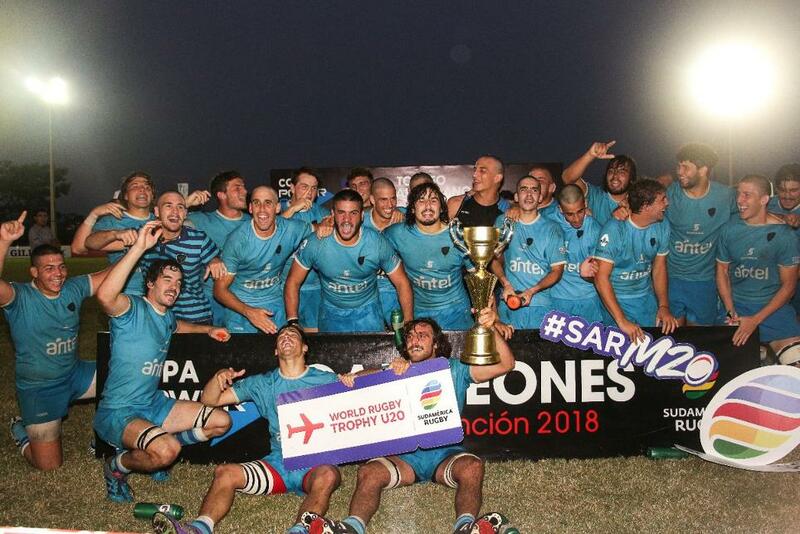 On the same weekend that Portugal triumphed in front of a jubilant 1,000-strong crowd in Coimbra, Uruguay booked their place at the World Rugby U20 Trophy 2018 as South American champions. Backing up earlier wins over Colombia (99-5) and Paraguay (38-12), Los Teritos secured the title in Asunción, Paraguay, by defeating Chile 41-7 in the third and final round. Chile had also gone into the winner-takes-all match unbeaten following earlier wins over Venezuela (119-0) and Brazil (30-3) but had to settle for second place overall following the loss to Uruguay. The game was over by half-time as Los Teritos made their superiority count with tries for Santiago Civetta, Joaquin Oneto, Manuel Ardao and Juan Contabile. Juan Nicola successfully converted all four and added a penalty before Chile hit back on the stroke of half-time through Monroy Mettitogo. Nicola kicked his second penalty in the 49th minute and after a scoreless 20-minute passage of play, Uruguay signed off with a fifth and final try for Alfonso Cat. With Hong Kong (Asia), Fiji (Oceania) and Namibia (Africa) already confirmed as participants along with Samoa, who were relegated from last year’s World Rugby U20 Championship, and the yet to be named host nation, there is only the North American qualification spot left to fill. That will be decided in June when USA face Canada.